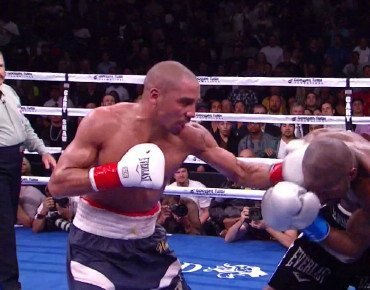 Andre Ward: Snapping At Mayweather’s Heels Pound-For-Pound! Last night, in taming “monster” Chad Dawson, the reigning light-heavyweight ruler, unbeaten master (yes, master) Andre Ward put on his best display so far in his naturally blessed career. Okay, Dawson had to shed eight-pounds in dropping down to super-middleweight, possibly weakening himself and affecting his punch resistance, but it really is tough to find any other fault with “S.O.G’s”, well, faultless performance. The dominant force at the in-fighting, at the long range stuff and the harder, more accurate, more spiteful puncher, the 28-year-old from Oakland delighted both his hometown fans and the boxing purists. Indeed, fellow masters such as Bernard Hopkins and Floyd Mayweather Junior (two greats Ward has surely studied on tape and has learnt a trick or two from) will have enjoyed, even marvelled over Ward’s 10th-round TKO master class. More aggressive than usual (perhaps because he felt Dawson’s lack of physical strength), Ward gave the slick, tall southpaw a beating in every department – physical, mental and everything in between. It’s even possible that “Bad” Chad will never be the same fighter again. Ward, aside from a tricky second-round, when Dawson’s stance and long arms gave him some troubles, won every minute of every session and he didn’t even appear to be firing on all cylinders. This is a scary thing – how great can Ward become and how special will he look if he is ever pushed to fight as hard as he can? It’s time to acknowledge how we have a very special fighter operating in the 168-pound division, and it’s also time to acknowledge how Ward is fully deserving of a lofty place in anyone’s pound-for-pound ratings. Unbeaten at 26-0(14), holder of the WBC/WBA/Ring Magazine titles and holder of wins over talent such as Carl Froch, Mikkel Kessler, Arthur Abraham and now Dawson, Ward, it could be argued, is already deserving of taking the number-one spot, P-4-P. Previous boxing news: How would tonight’s Andre Ward match up against the Joe Calzaghe who beat Mikkel Kessler? You are here: Home / Boxing News / Andre Ward: Snapping At Mayweather’s Heels Pound-For-Pound!